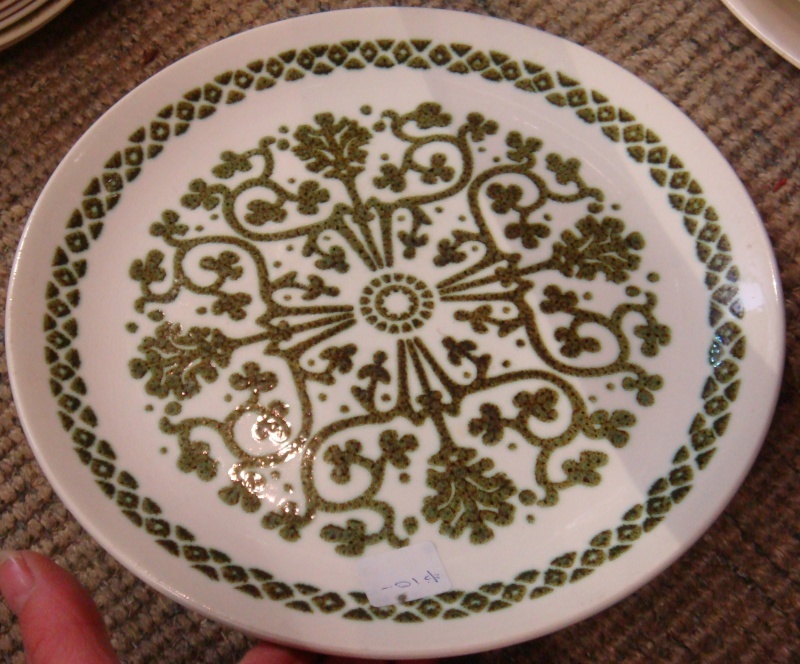 Unusual design, have been to Eclectic Antique Centre in Nelson who kindly let me take photos! Fantastic shop, could spend all day in there! 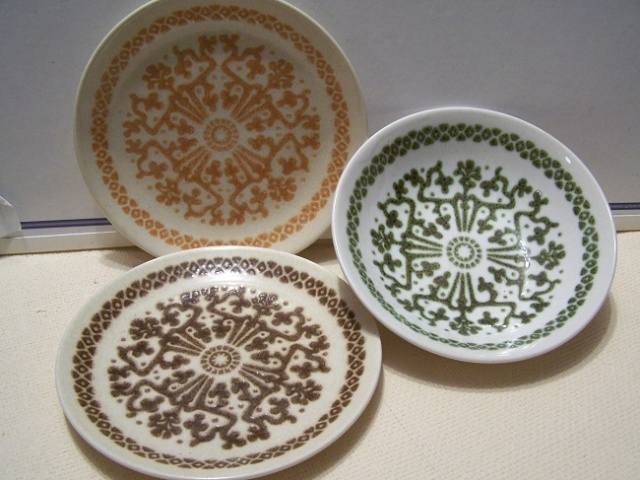 Fi sent this photo to the site to show that Baroque comes in three colours, but the pattern number is the same. Thank you Fi ! Hi Ev:- Re the photo of the other 2 colours, Fi says they are the same pattern number but they look like they are on ash rather than low sol? Portage trust: in the folder "not used yet" there "Eden Green" ( with no pattern number) could this be it? I would say your thoughts would be correct re the first two. I would still like to go over them though. Re the green one the only thing bothering me is the Antique Green which we have established the colour for now. I will look into it when I can. I seem to remember that there are a few patterns that look like this. There are a few patterns in that lot that were put into production, even though they don't have a number designation in those records. if they are indeed Baroque as Fi has stated. that is bugging me. 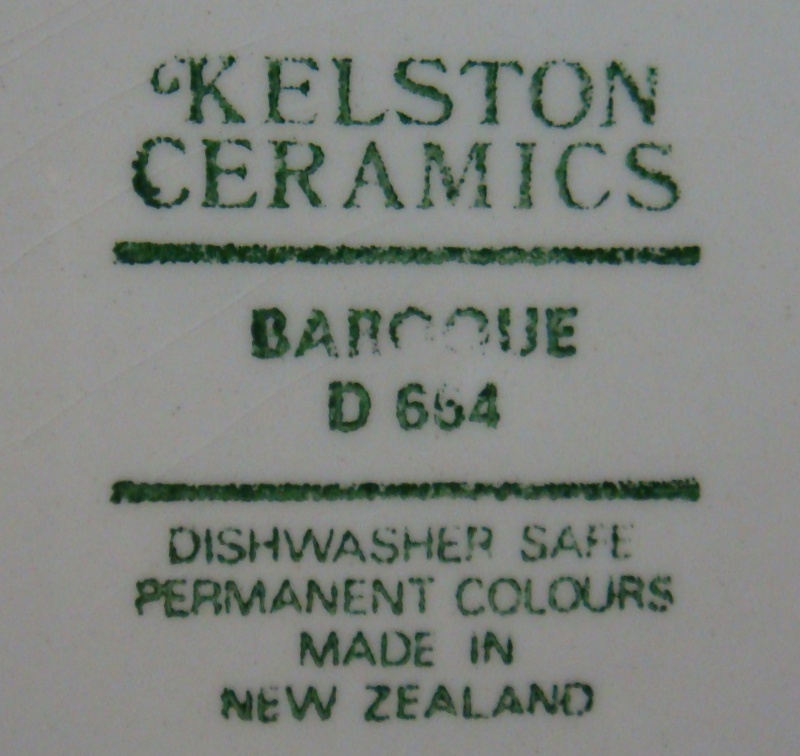 Also the matching cup is a 3038 with Antique Green on the outside and HGM [High Glaze Matt] on the inside. It doesn't match that green colour does it? It's a browny green. Keep this boiling Janice! I will add this cup here - and at least they are all together for when we figure out the names. Now that cup is definitely Tan isn't it ? 3033 Shape. 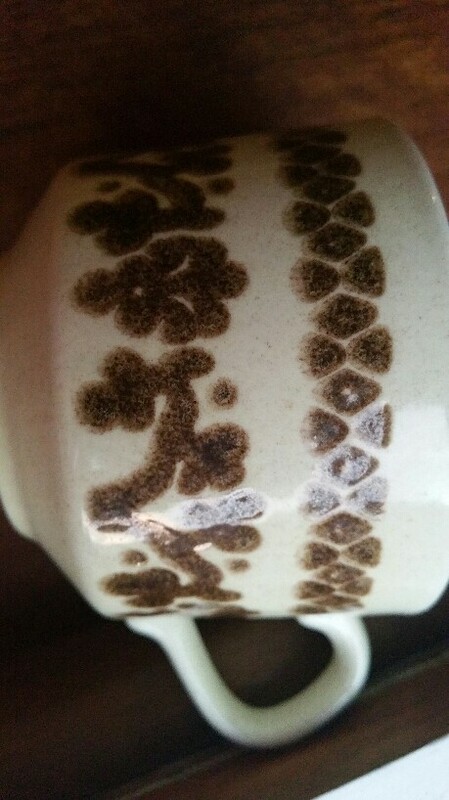 It is tan but on a white glaze unless it is HGM? 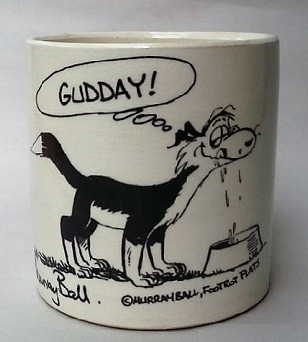 Do you have something else in that glaze that you can identify from the records? Xmas lunch today for those that will be away next Friday and I shouldn't be here, but I found that I wasn't quite right re the HGM. 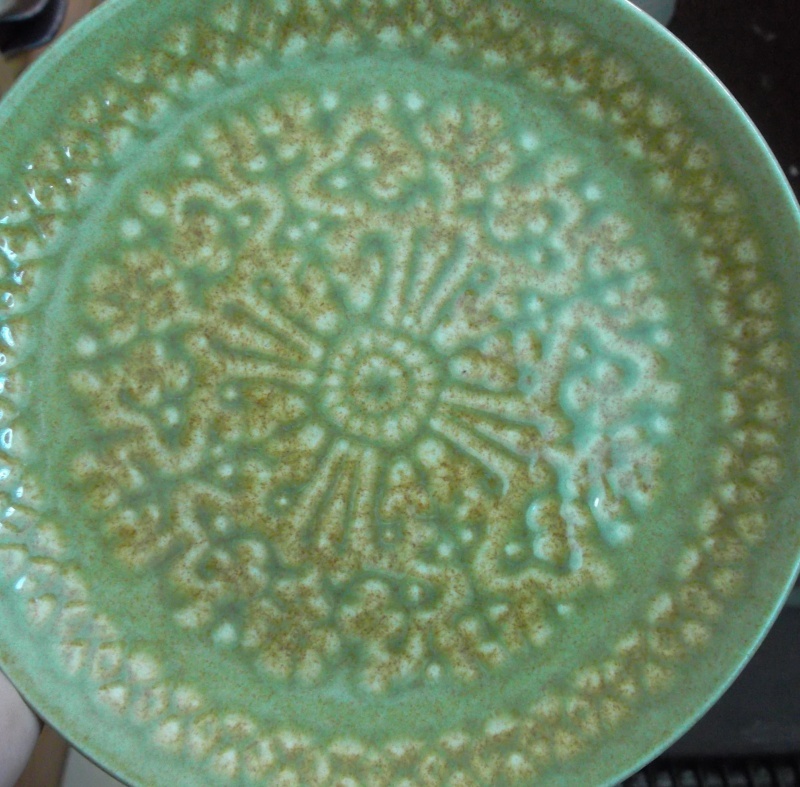 It refers to the High Gloss Micaceous glaze and I think the micaceous refers to speckles in the glaze. 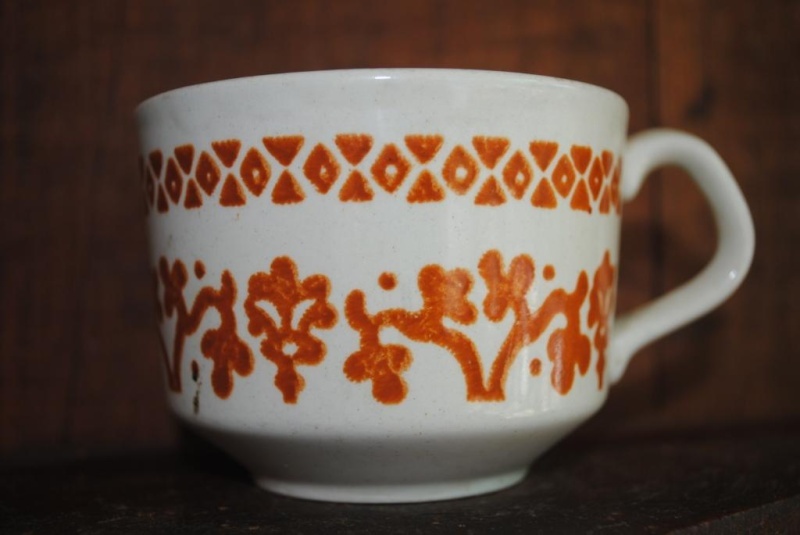 I'm trying to find other patterns that use this glaze and in doing so I've found there is a wealth of info regarding glazes and their glazes numbers. So I will have to record all of these so that we can find examples easily of each one. Ev.. Hope lunch was yum! Did you find that HGM has the Deco number 026? That seems to be the case from the decoration number book. I will check as you suggest, but the Arcadia plate was not mine, there will be other though. I am out & about today/tomorrow but when I get chance I will look. but also HGM Vases 173 which are both mysteries to me. but that is just a tiny look at the records, so an in depth study is required. I will try to have a look when I get a chance. "Micacaecious stands for the speck on the glaze this was tiny specks of magnetic iron introduced into the glaze"
Edits to add that under magnification there is a tiny speckle in the very glossy glaze and I should be able to identify it again if I see it now. I found this on the weekend. 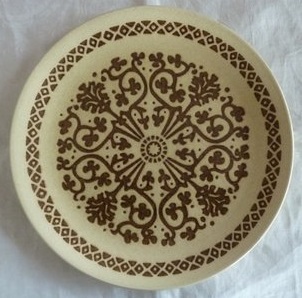 It's brown baroque pattern but the glaze is not white. It's too difficult to see what the background glaze is Janice. Have you checked the records as I think there are at least 5 different Baroque looking patterns. miranda g has sent this photo to the site and thinks that the background is clover. Perhaps the background is Ash like the ones the Janice has? I think these are Gothic brown 755 and Gothic Tan 754, as they use 3033 cups which I have and its not a clover glaze its lighter coloured glaze ie Ash. Thank you Ev and Janice - I'm interested to learn that there are different names for what I assumed was "clover" background. Ash! What others are there please? E.g. do the backgrounds of Herald, Earthstone Landscape and Gothic (that I thought was Baroque) all have different names? 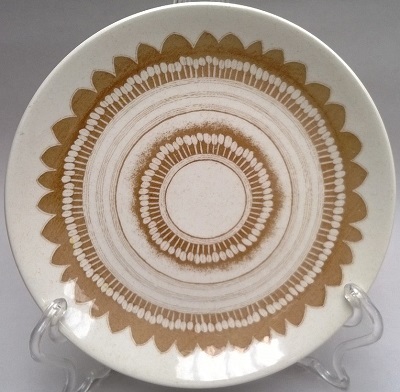 Because my plates of these patterns all suddenly look slightly different! Fascinating stuff - lots to learn.